The Maryland Jockey Club offers an array of food and beverage selections, from something as simple as a hot dog and soft drink to a gourmet meal in one of our restaurants. For reservations or information regarding dining & hospitality here at Laurel Park, please contact us at (301) 725-0770. For information regarding group event planning and our facility options, please contact our Group Sales Department at (877) 206-8042 and ask to speak to one of our event specialists who will help you plan and customize your next event. featuring high-quality, locally sourced food. 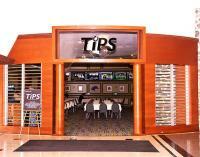 Featuring 30 televisions, Tycoons is our primary restaurant for the simulcast enthusiasts. With over 20 televisions, you won't miss a minute of the simulcast action. Open on Saturdays for Special Events. This is the largest of our restaurants and most popular choice for group events, with a seating capacity of approximately 450 guests. The dining room features floor to ceiling windows with an expansive view of the Race Track. Our newest dining area offers a relaxed view of the track in a garden style atmosphere.